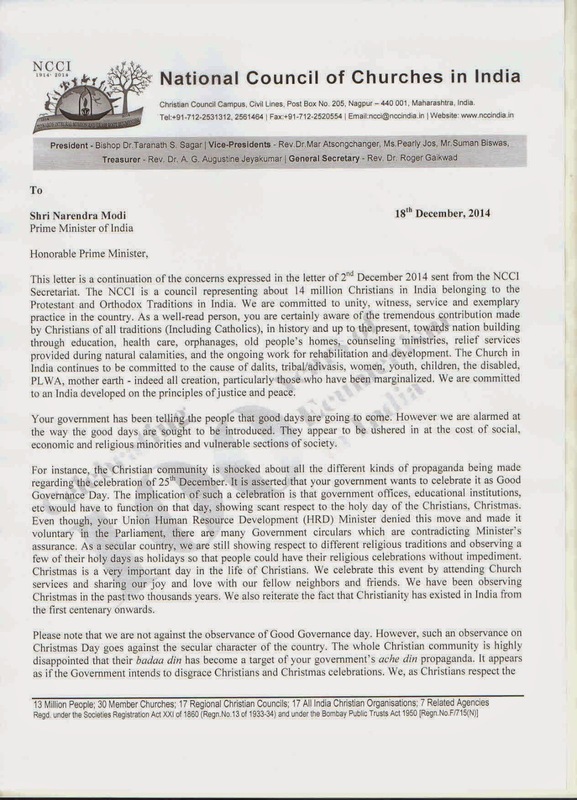 National Council of Churches in India: Letter to the Indian Prime Minister expressing concern over the "good-days" and "good-governance"
Your government has been telling the people that good days are going to come. However we are alarmed at the way the good days are sought to be introduced. They appear to be ushered in at the cost of social, economic and religious minorities and vulnerable sections of society. For instance, the Christian community is shocked about all the different kinds of propaganda being made regarding the celebration of 25th December. It is asserted that your government wants to celebrate it as Good Governance Day. The implication of such a celebration is that government offices, educational institutions, etc would have to function on that day, showing scant respect to the holy day of the Christians, Christmas. Even though, your Union Human Resource Development (HRD) Minister denied this move and made it voluntary in the Parliament, there are many Government circulars which are contradicting Minister’s assurance. As a secular country, we are still showing respect to different religious traditions and observing a few of their holy days as holidays so that people could have their religious celebrations without impediment. Christmas is a very important day in the life of Christians. We celebrate this event by attending Church services and sharing our joy and love with our fellow neighbors and friends. We have been observing Christmas in the past two thousands years. We also reiterate the fact that Christianity has existed in India from the first century onwards. Please note that we are not against the observance of Good Governance day. However, such an observance on Christmas Day goes against the secular character of the country. The whole Christian community is highly disappointed that their badaa din has become a target of your government’s ache din propaganda. It appears as if the Government intends to disgrace Christians and Christmas celebrations. 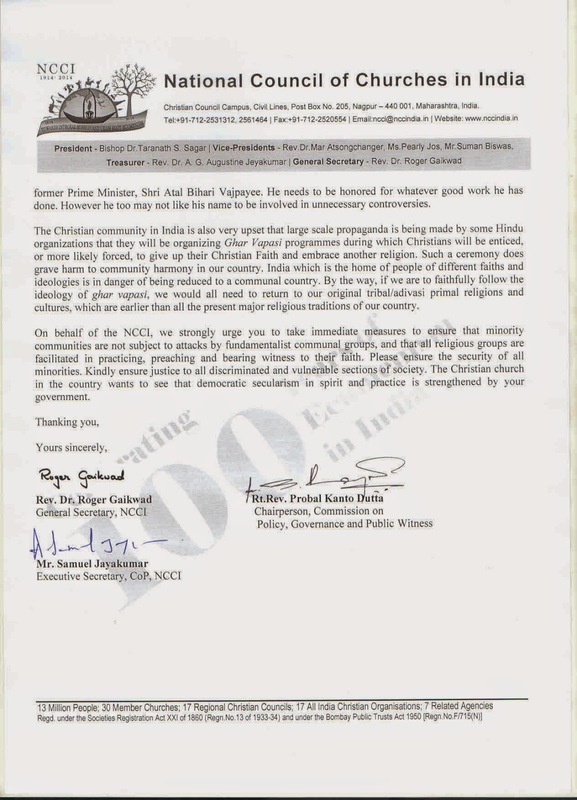 We, as Christians respect the former Prime Minister, Shri Atal Bihari Vajpayee. He needs to be honored for whatever good work he has done. However he too may not like his name to be involved in unnecessary controversies. The Christian community in India is also very upset that large scale propaganda is being made by some Hindu organizations that they will be organizing Ghar Vapasi programmes during which Christians will be enticed, or more likely forced, to give up their Christian Faith and embrace another religion. Such a ceremony does grave harm to community harmony in our country. India which is the home of people of different faiths and ideologies is in danger of being reduced to a communal country. By the way, if we are to faithfully follow the ideology of ghar vapasi, we would all need to return to our original tribal/adivasi primal religions and cultures, which are earlier than all the present major religious traditions of our country. On behalf of the NCCI, we strongly urge you to take immediate measures to ensure that minority communities are not subject to attacks by fundamentalist communal groups, and that all religious groups are facilitated in practicing, preaching and bearing witness to their faith. Please ensure the security of all minorities. Kindly ensure justice to all discriminated and vulnerable sections of society. The Christian church in the country wants to see that democratic secularism in spirit and practice is strengthened by your government.